Everything and nothing happens in La Ciénaga, the debut feature from Argentinean director Lucrecia Martel (The Headless Woman ). Spanning the space of one aimless summer, this avant-garde drama captures the boredom and the heat for one extended family forced together by circumstance as life changes and petty concerns swirl all about. The narrative kicks off with an accident. At a pool party, middle-aged mother Mecha (Graciela Borges) falls face first, smashing her drinking glass against her chest. Was she drunk? Did she trip? Stories vary. But the lacerations above her breasts seem serious enough that her sister Tali (Mercedes Morán) loads her kids in the car and heads over. Mecha has two teenaged daughter of her own, as well as an adult son, José (Juan Cruz Bordeau), who also makes the trip, leaving his older lover (Silvia Baylé) in Buenos Aires. There is something oedipal suggested by this couple, and in general José is portrayed as a sexual being, with hints of incestuous longing from his siblings and his cousins. Which is all part of the strange hormonal miasma that hangs around everything. The children--and there are many what with friends that hang around--seem driven by animal impulses. Boys point their rifles at girls in the woods, girls play tricks on unsuspecting boys in the town. One of Mecha’s daughters, Momi (Sofia Bertolotto), is nicknamed “Dirty” because she’ll go days without showering or brushing her hair. There is a casual racism toward the indigenous people, including Isabel (Andrea López), the household maid. Every moment in La Ciénaga feels like it’s the moment before something awful is going to happen. And yet, outside of the occasionally injury or quick flash of violence, it never really does. The worst thing remains uncommented on, unseen, unresolved. Like the apparition of the Virgin Mary that is a running thread throughout La Ciénaga, any big happening stays invisible, only hinted at. Meaning, like spirituality, is ephemeral. This is Martel’s strange balance, that restlessness of an idle summer, particularly for a tween like Momi or the boy Joaquin (Diego Baenas), who has already lost an eye as a consequence of being allowed to run wild. Everyone is always getting dirty, they are consistently uncomfortable in the heat, and the backyard pool where Mecha hurt herself is so filthy as to be unswimmable. 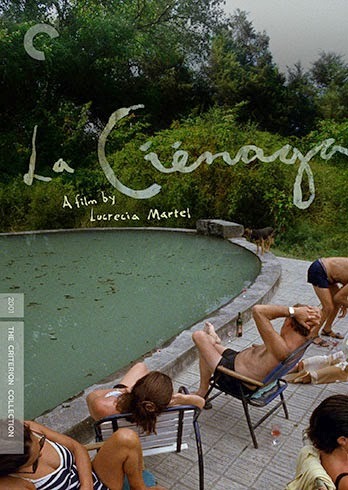 The title La Ciénaga translates as “The Swamp,” and while it most certainly refers to this swimming pool, it’s also a descriptive of the entire state of being Martel’s depicting: this family is stuck in a swamp of history and the expectations that grow there like algae. Martel shoots all these goings on with a similarly lazed but observant eye. She takes her time with some takes, working around the tangled bodies, squeezing into tight quarters. Natural lighting pervades most of the scenes, as does natural sound. There are lots of marvelous audio touches throughout, like the dual ringing telephones, or the regular barking of unseen dogs. There is a kind of naturalness to the whole affair that befits La Ciénaga’s episodic narrative. As the heat eventually makes some folks cranky, and certain conflicts come to a head, Martel continues to tease our expectations, only to gracefully exit more quietly than she entered. "unswimmable" is not a word. May I suggest this revision: "backyard swimming pool where Mecha hurt herself is so filthy no one will use it." Btw, "laze" is a verb but not an adjective. So "lazed" as you use it is incorrect. In answer to your query, no, you may not suggest that. Rather than correct your grammar like Richard, I just wanted to let you know that I linked to you at Criterion Blues where I am working on a similar project, but closer to the beginning than you are. It would be great if you would link back. The Martel was a nice discovery as she wasn't on my radar at all. I've heard The Headless Woman is good as well.